The CAMWS Award for Special Service formally acknowledges exceptional promotion of classics and/or accomplishments for the profession in CAMWS territory. The award is given pro re nata. Eligibility: CAMWS membership is not required. 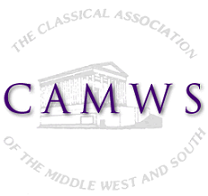 Recipients can be classicists or non-classicists who have made special contributions to the promotion of Latin and Classical studies, especially at the state and local level, in CAMWS territory. Ideal candidates include people involved in our field who do much for their local communities or classics in general, but do not interact frequently, if at all, at large meetings. Nevertheless, these people make MORE than a difference. Suitable candidates for this award also include parents or community members who support local Latin programs in notable ways; companies that donate money or other resources for the promotion of Latin; school administrators who help Latin teachers by giving access to school rooms or supplies or extra funds; newspapers or magazines that give free advertising for events; benefactors who give money for books or scholarships; or students who have promoted Latin in an original manner. Nomination and selection process: Please submit a signed statement of nomination, 500-600 words in length, that describes the nominee and his/her work. Nominations for the award can be emailed to specialservice@camws.org (or mailed to CAMWS, 700 E. Broadway, Monmouth, IL 61462) but must be received by January 30. Supporting documents are not required, but they may be solicited if questions arise. The chair of the Steering Committee on Awards and Scholarships with advice from the five subcommittee chairs will then determine the winners. Announcement of the results will be made at the spring CAMWS meeting. If you have any questions about this award, please contact the Chair of the Steering Committee on Awards and Scholarships at steering@camws.org.